Ephemerisle was originally organized by the Seasteading Institute (http://seasteading.org/)) (TSI) to promote the cultural concept of seasteading - the construction of autonomous floating nation-states - in a hands-on and accessible way. The first Ephemerisle was held on October 2-4th, and located just SE of where Disappointment Slough (which extends to Paradise Point Marina) meets the main channel, as seen on this Google Map. The event was sponsored & run by The Seasteading Institute, with central platforms built by Chicken John Rinaldi and his hard-working crew, who built a work boat and crane for the operation. The event amassed 9 houseboats and a community*built platform anchored to the shore. A variety of art projects were funded by TSI. The event attracted media attention and was the subject of a documentary by Stanford Film Master's student Jason Sussberg.12345. Perhaps most importantly, it was successful enough to lead to community interest and growth in future years. We're on a Floating Thing - by Dav Yaginuma - Ephemerislers all dancing to "I'm On A Boat" song Sunday Morning. Love the line: I'm on a milk crate! First test of Patri's Pirate Pyramid raft - by Sean Hastings. This raft capsized during Patri's journey to the site when he tried climbing to the top for a better view. Ephemerisle Saturday night - short clip of how the island looked Saturday night. For 2+ years, Ephemerisle 2009 (picture taken Friday, before full combining of boats/platforms) was in the Google Maps satellite image for that location, it was lots of fun to show it to people in their Google Maps :). As of 2012, the image has been updated and Ephemerisle is no longer there. Sean Lynch: Lessons learned at Ephemerisle, and the dairy ferry (about the rope ferry). Matt Bell: the Ephemerisle experience - *It was beautiful, sublime, chaotic, messy, and full of potential for future years. *, many pictures. ephemerisle, year 1 - a grand success! Will Wilson -- his questions before attending Ephemerisle, and his thoughts afterwards. Describing a few tiny fragments of an incredible experience. TSI decided that the liability from the event was too serious to bring it back in a 2nd year without getting insurance. About a month before the event was supposed to happen, TSI cancelled it because the cheapest insurance they could get was over $300/person. A group of people who had already rented houseboats for the event decided to show up anyways for a leadersless non-event: "Not Ephemerisle" was born. 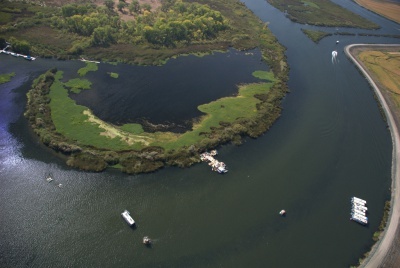 In the second year, Ephemerisle took place during July 23-25, 2010, in the Mandeville Tip County Park on the Sacramento – San Joaquin River Delta (map). This year, The Seasteading Institute officially abandoned the event about a month before it was to begin because the insurance costs turned out to be around $300/person. As a community, we decided to show up anyway and create an unofficial self-organized event, branded "NotEphemerisle". Despite the lack of central organization, it still worked quite well, and around 120 people showed up and had a great time. Besides recreational activities, the event also hosted 12 "Memocracy" talks. TSI handed the name "Ephemerisle" back to the community and the community run event continued and turned into a huge success. 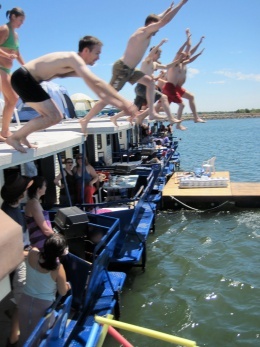 Every available houseboat in the delta was rented for the event and a large community/dance platform was built. Ephemerisle 2011 took place during Jun 9-12, in the same location as the previous two years - the Mandeville Tip County Park on the Sacramento – San Joaquin River Delta (map). After having to rebrand the event "NotEphmerisle" (or "UnEphemerisle") last year due to insurance and legal technicalities, this year The Seasteading Institute did not officially attempt to organize the event and let us use the name "Ephemerisle". We rented out every houseboat in the region, built a 20x24 floating platform, brought around 200 people, and made the event an unequivocal success. 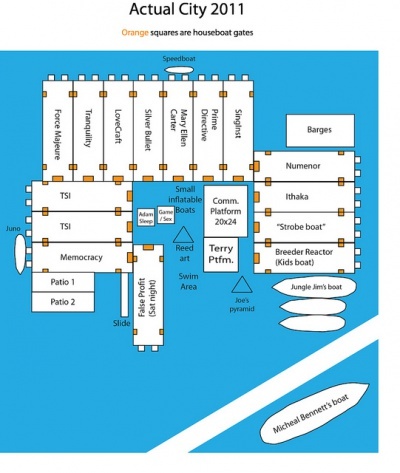 Read Matt Bell's excellent summary of Ephemerisle 2011. Paul Bohm also write his thoughts on what made Ephemerisle a great occasion to connect. What worked and what didn't in 2011. In 2012, the Ephemerisle "city" was broken into 3 islands to simplify anchoring the large number of boats. A HUGE windstorm hit, houseboats were damaged, anchors were pulled out, and the community as a whole learned a ton about boating safety, and gained a new respect for the elements. The first year of islands! Ephemerisle 2012 took place from June 6 to 10 at Mandeville Tip, the same location as the previous year. The event grew significantly this year, with houseboats and sailboats numbering at least 25 and attendance estimated around 300. This year we experimented with breaking the city into three separately anchored islands. North and South were made up of houseboats and each had their own platform. The West Island was made up of sailboats and powerboats. A huge windstorm picked up just before the weekend with winds up to 40 knots. Anchors were pulled out. Boats were damaged. And calls were made out telling no else to come to the event because everything was falling apart. Miracuously, the two 60lb anchors held the two houseboat islands by themselves when all other anchors had pulled free preventing these islands from drifting away. Please add links to your photo albums and videos of the event below! What did you help build or create this year? Add an event to the 2012 central platform schedule or review the currently proposed events. If you want to view the performance/broadcast schedule, make your request to thipdar ta gmail tod com. If you would like to play CDs for Radio FMerisle or be a performing DJ, you can send a request for a time slot to the same e-mail address. Fill out the boat/platform survey so we can plan the city. Learn how to build your own floating platform! Come to the build your own land event, April 7-8. Central Platform **FULLY FUNDED** - Bring back the Central Platform from last year and expand it to be 24'x28'. Cuddle Platform / Gallery **FULLY FUNDED** - Ephemerisle needs a space where community members can chill out, cuddle among friends, admire art, practice yoga, and talk about all the great ideas that our floating festival inspires! Anchoring **FULLY FUNDED** - This has been a problem in the past at Ephemerisle. We met our original goal. Now we're looking for a couple of hundred extra dollars for additional rope and chain. Help ensure Ephemerisle literally doesn't get blown away. http://www.kickstarter.com/projects/22415368/jellypus-floating-flashing-art-thing-take-2 [Jellypus] **FULLY FUNDED** - a massive underwater octopus like light show. There is a [second round of funding](https://www.wepay.com/donations/jellypuss-round-two) to cover extra costs to the project. Lemonade and Lasers **FULLY FUNDED** - a floating lemonade stand with lasers. support the Radio FMerisle Saturday Night Dance Party. About $1,400 in expenses paid out-of-pocket and the event was cancelled due to high winds. Still time to donate, if you want to express appreciation for Rion Fish's Friday evening performance. Speed Limit Signs **TIMED OUT** - temporary floating speed limit signs, to warn boaters to slow down near Ephemerisle. These signs will be reuseable for years. Overly-optimistic; signs were not stable in high wind. Well deserved rum **FULLY FUNDED** - send bottles of rum along to Paul Wheeler and the two people (who despite not being able to attend Ephemerisle) loaned us the big expensive 60lb anchors. Repay for Paul's Cut Anchor **FULLY FUNDED** - Paul lost an anchor at some point; most likely someone motored over his anchor line. Adam found a nice used anchor, but let's get this and his bottle of rum. But soon dark thoughts and fears took hold! Of help fell on deaf ears. 'till Jungle Jim got there. But a mayday already had been called! 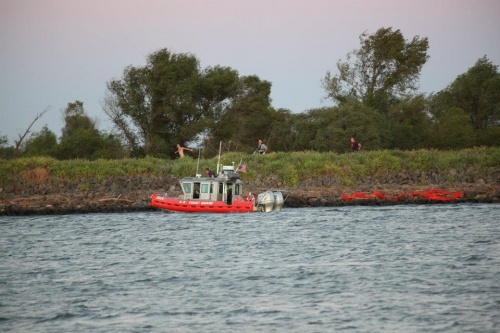 And the Coast Guard soon came 'round. in cuffs for a one-way trip. Back in the dark'ning waves he leapt! A police boat on his flank. He reached the road, he ran, but no! 'Twas not a long-lived flight. They set him free, no bail. Won't always come for free. The idea of "islands" were taken to a new level. From 2009-2012, decisions were made by general consensus or by ad hoc leaders. From 2013 onward, Islands gained their independence. Every self-proclaimed island was responsible for it's own rules, self-reliance, system of government, etc. Waterslide. Tea House. Cooperative spirit. Social but mellow evenings. 8 houseboats, a few sailboats. Space Pirates. People seriously committed to social responsibility, fun, and technology. And Bacon. The biggest year of Ephemerisle so far. Titan island was huge and largely the central focus of the year. No real problems, and everyone left excited for 2015. There were two islands, with speedboat and jet ski service gracefully provided by several kind folks, especially Randolph Hencken of The Seasteading Institute. Turned into a huge conference with almost everyone attending and microtalks all day. 4 chefs and their sous chefs competed in an epic battle. Jonathan Cain took the top prize. In early 2017, heavy storms damaged the Paradise Point marina. As a result, the marina only rented out 5 houseboats (instead of the 20+ that they normally rented out). First year that there were no rented houseboats. First year a submarine was in attendance (Fangtooth). Tenth consecutive year with no major injuries or deaths. This page was last modified on 29 July 2018, at 19:32.